Facts about Himalayan Persian Cats, "Scientific name for Himalayan Persian Cat is Felis Catus". The Himalayan Persian cats, also called as Himmies. The Phoenicians bought this cat to Europe with a longer, silky coat. Over the years the Persian cats were bred to enhance the longhair trait. 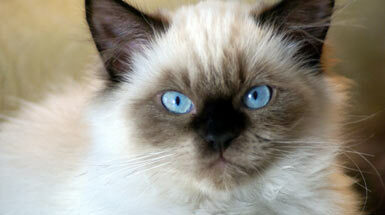 The work to breed and develop the color-point Persian or Himalayan, in 1950s began in America. This is a man made breed of cat. The Himalayan Persian cats were developed by crossing Persians with Siamese cats. So, Himmies got their color features and blue eyes from the Siamese. Himalayan Persian cats may be crossed with Persians and few other breeds, but today, no matter what its a genetic makeup, it has earned a special popularity among pedigreed cats. After several out crossings, one character of the Persians kept persisting within the Himalayan Persian cat, their sweet nature, easily controllable and quiet attitude. Himalayan Persian cats just enjoy sitting on a lap, playing with children in exchange of gentle combing of its hair and chasing a toy. The Himalayan Persian cats are affectionate. Himalayan Persian cats can see at levels of light six time lower than a human, this is why cats can catch mice so easily at night. The Himalayan Persian cats are gifted with large, expressive eyes. Himalayan Persian cats outer ear uses 32 muscles to control it, and a human has only 6 muscles in its ear and a Himalayan Persian cat can move its ears 180 degrees. A Himalayan Persian cat can move their ears independently. The cat's hairball is called a "bezoar" (meaning a concretion or calculus found in the intestines or stomach of certain animals, in particular ruminants, formerly alleged to be an effective cure for poison). The Himalayan Persian cat are attentive only to the family members and few regular guests. The Himalayan Persian cat doesn’t tolerate loud environments at all and they are quiet and rather dignified. So the Himalayan Persian cat prefer a serene home with little changes. Their voice is soft, pleasant and musical. Himalayan Persian cats on average sleep 13 to 14 hours a day and when they are awake, the spend a lot of time licking themselves to keep themselves clean. Himalayan Persian cats help control rodents like small rats and mice where the live homes, warehouse, ect. A female cat is called a "queen or molly", male cat is called a "tom" and the name "clowder" is called a group and young or baby cats are called kittens. The Himalayan Persian cat has simple needs, just regular meals, a little playful time with a toy along with its favorite family member and lots of love in terms of grooming and combing its hair. The Himalayan Persian cat doesn’t jump on shelves or kitchen counters to steal food. As far as its food is concerned, it likes to eat at floor level. When the owner is not around the Himalayan Persian cat could be found cuddled on a sofa or chair or in a corner until the owner gets home. Health problems could be genetic. The Himalayan Persian cat may have breathing difficulty from constricted nostrils, dental malocclusions, excessive tearing, progressive retinal atrophy, predisposition (it’s a fungal infection caused by ringworms), nervous system disorder etc. The Himalayan Persian cats are very sensitive to heat. The Himalayan Persian cat need daily grooming as they have long beautiful coat that gets dirty and tangled faster. The Himalayan Persian cat is an indoor-only cat. There are over 500 million domestic cats in the world and 88 million in the United States Approximately 40,000 people are bitten by cats in the U.S. annually. Himalayan Persian cats have an average weight around 8.7 to 12 pounds (3.9 to 5.4 kg). Himalayan Persian cats have very sharp hearing and their sense of smell is fantastic. Himalayan Persian cats average life span is around 12 to 15 years. The reason why Himalayan Persian cats can squeeze through very small spaces is that they have no collarbone and free-floating clavicle bones that their shoulders are attach to their forelimbs, that's why a Himalayan Persian cat can fit through a hole the same size as its head and they use their whiskers to determine if they can fit through the space. A Himalayan Persian cat can climb up a tree well but can not climb head first down a tree, because all the claws on a cat’s paw points the same direction, to get down from a tree, a Himalayan Persian cat has to back down. A Himalayan Persian cat can run at a top speed of about 30 mph (48.2 km) over a short distance. A Himalayan Persian cat rubs against a person to not only to be affectionate but also to mark out its territory. A Himalayan Persian cat does not like water because its fur is not insulate it well when it gets wet. A Himalayan Persian cat averages about 12 whiskers on both side of its face. A Himalayan Persian cats jaw can not move sideways, there for a cat can not chew large pieces of food. A Himalayan Persian cats back is highly flexible because of its 53 loosely fitting vertebrae. The body of a Himalayan Persian cat has 230 bones. While a human body has 206. Compared to a humans who only have 34. The average Himalayan Persian cat temperature of a cat is 101.5 °F (38.6 cel). The Himalayan Persian cats heart beats at 110 to 140 a minute, That is almost twice as fast as a human heart. A Himalayan Persian cats has 30 teeth while a kittens has about 26 teeth that they will lose at about 6 months of age. A Himalayan Persian cat has the ability to jump up to six times its length.